LB4LC/3Y, Old callsign for an epic time – W.A.P. 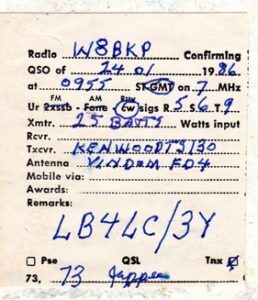 A question did arise among the Antarctic Ham Radio community about the location of LB4LC whose QSL card seems to say he did operate as /3Y in 1986. We did carefully check the card which is shown on Tom K8CX’s great Antarctic QSL collection (http://hamgallery.com/qsl/country/Antarctica/index.html) and have reached the conclusion that the Bay, shown on the front side of the QSL couldn’t be Bouvet Island. If you look carefully at the photo, that is Terra Nova Bay, Antarctica (75° South, 164° East), WAP NOR-Ø9 where the Norwegians set a field camp and where, just a few hundred meters away (74° 41′ 42″South, 164° 07′ 00″East). 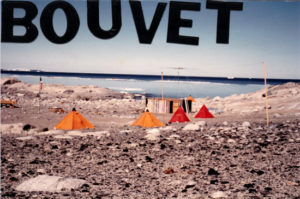 Bouvet does not absolutely have such a place gently sloping on the sea! It is not clear why “Bouvet” is reported on the card, let’s assume that, considering the /3Y on the callsign, this could have push the printer to add it on the QSL. In addition, the operator of LB4LC, now LA4LGA was contacted by LA5HE; He said he never operated from Bouvet Island.